1. 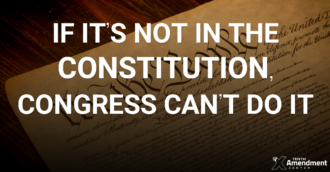 With the U.S. Constitution, We The People created the federal government. It is our “creature”, and has no powers other than those We granted to it in The Constitution. …In free states, the constitution is paramount to the statutes or laws enacted by the legislature, limiting and controlling its power; and in the United States, the legislature is created, and its powers designated, by the constitution. If you, dear Reader, will study this paper and read the Constitution, you will know more about it than most State & federal judges, most law professors & lawyers, most who spout off on TV & radio, and anybody in Congress (except for Michele Bachmann and perhaps a few others). And you will certainly know more than anyone currently occupying any office in the executive branch of the federal government. 2. The federal government * has three branches: Article I of the Constitution creates the legislative branch (Congress) & lists its powers; Article II creates the executive branch & lists its powers; and Article III creates the judicial branch & lists its powers. To define and punish piracies and felonies committed on the high seas, and offenses against the Laws of Nations. Other provisions of the Constitution grant Congress powers to make laws regarding: Click here to read more.